Americans consume in excess of 18 million litres (5,000,000 gallons) per year of cranberry sauce; intrigued, I dragged my husband on a warm but cloudy day at the end of October to Acushnet in Bristol County Massachusetts, to visit a cranberry farm and learn something about the native berry turned into sauce. At the same time, at the other side of the world, my mother was busy harvesting olive. She has about a dozen olive trees in her orchard in Lebanon, which gives her annual supply of oil and olives. The trees have been in the family for as long as I remember and that makes them old but I have a suspicion they may even be much older. 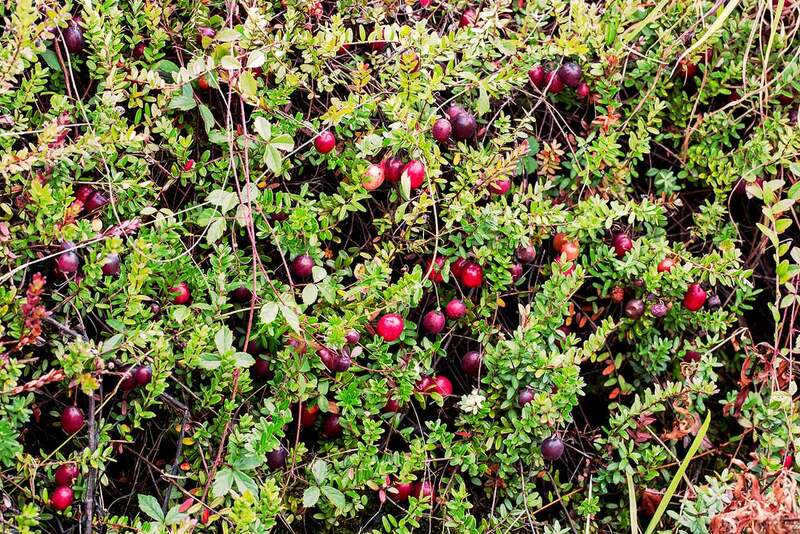 Although cranberries are native to America and have been around for hundreds of years, the cranberry vine’s life is relatively short (they can live up to 150 years) compared to that of an olive tree. Nevertheless in the same way that the olive tree is witness to its native land’s history, cranberries too come with a past. Up until the 19th century, the vines grew wild in the northeastern part of America. They thrived in natural sand and clay ponds (nowadays known as bogs), which had been carved out of receding glaciers thousands of years ago. They pollinated and reproduced naturally. 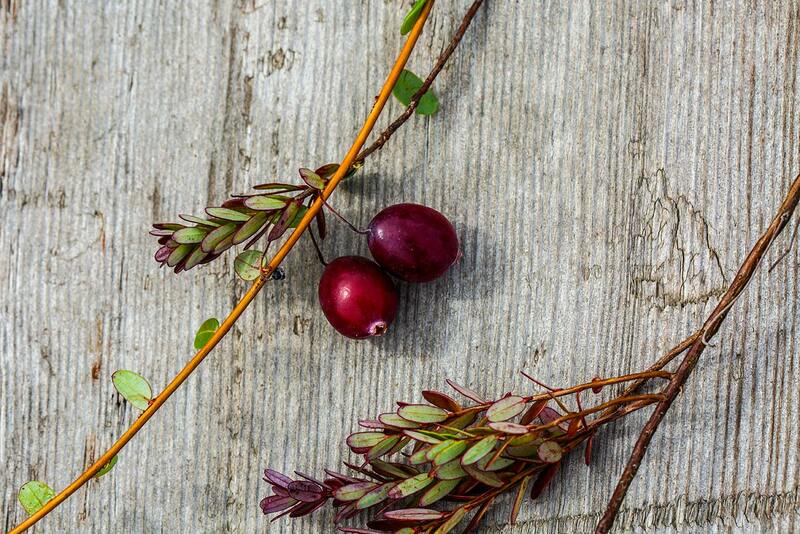 Native Americans collected the berries to eat and to use as medicine. They made poultices with the crushed leaves and boiled them to drink as tea. They also found that berries were good for dying their clothing and various other apparatus red. They made a potent protein-rich bar, which they took on trapping or hunting expeditions. Pemmican, as it was known, was dried deer meat and fat pressed with cranberries. Preserved by the fat and acid content, pemmican could last for months without rotting. European trappers discovered it and took to it as necessary sustenance while living in the wild during the long and freezing months of hunting. The demand for pemmican was such that it eventually fuelled a bloody war known as the Battle of Seven Oaks. However we can only assume that settlers’ families and cooks did not take to pemmican or else it probably would have survived in some form to this day. 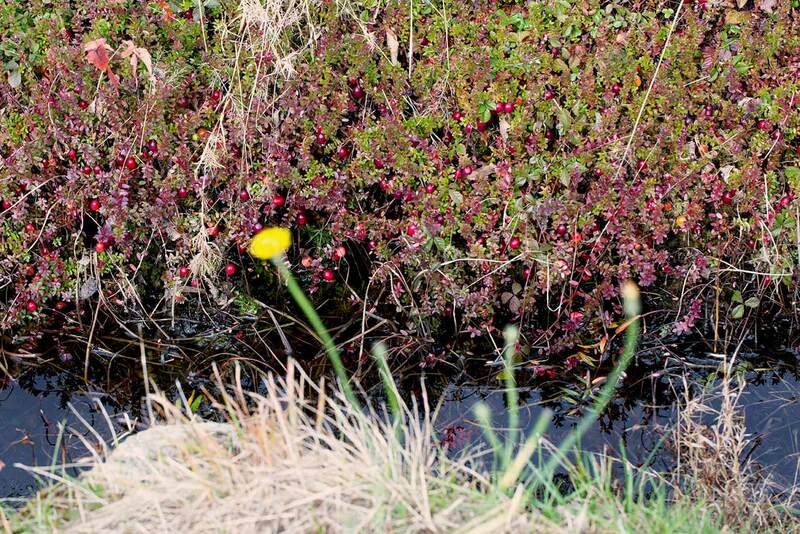 It is possible that the Europeans were familiar with the cranberry or at least a similar variety, which grew in parts of Northern Europe. They would have eaten it in the way they knew, cooking, mashing and serving it with meat and fowl; although the first written mention of cranberries eaten alongside roast turkey only appeared 1796, in Amelia Simmons book American Cookery. We also know from the muted cranberry coloured houses of New England, that they mixed the mashed berries with soured milk to paint the clapboards and historians also tell us that sailors loaded their ships with cranberries (the waxy coating kept it fresh for many months) to help them fight scurvy. The fruit ripens in the autumn and harvest takes place between September and October. 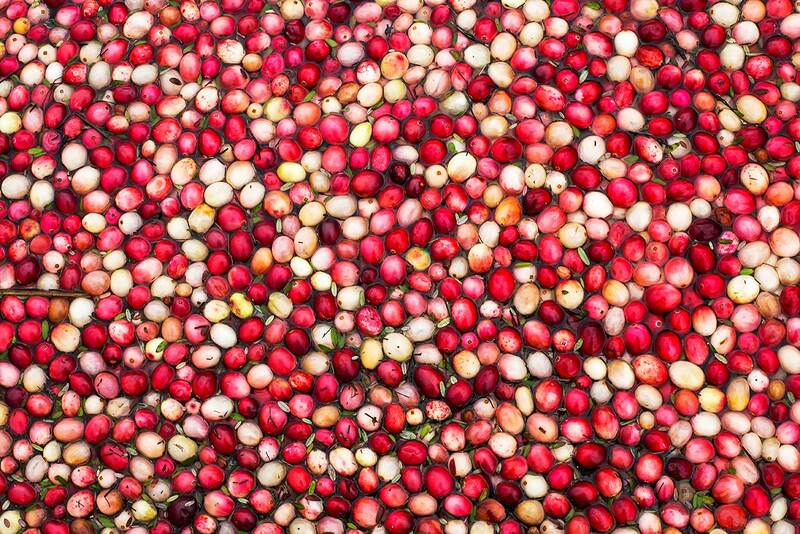 Most of the cranberries in the US are wet-harvested, which means that the bogs are flooded while water-reels dislodge the berries, which float up the surface where they are rounded and gathered. 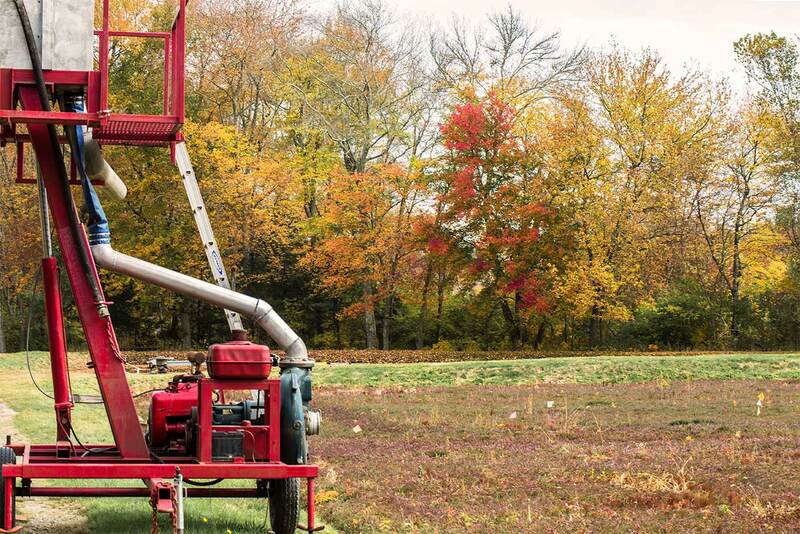 Wet-harvest berries are used in canning and juicing whereas the dry-harvest berries that are combed off the vines by mechanical pickers, are marked for the fresh fruit market because they bruise less and last longer. 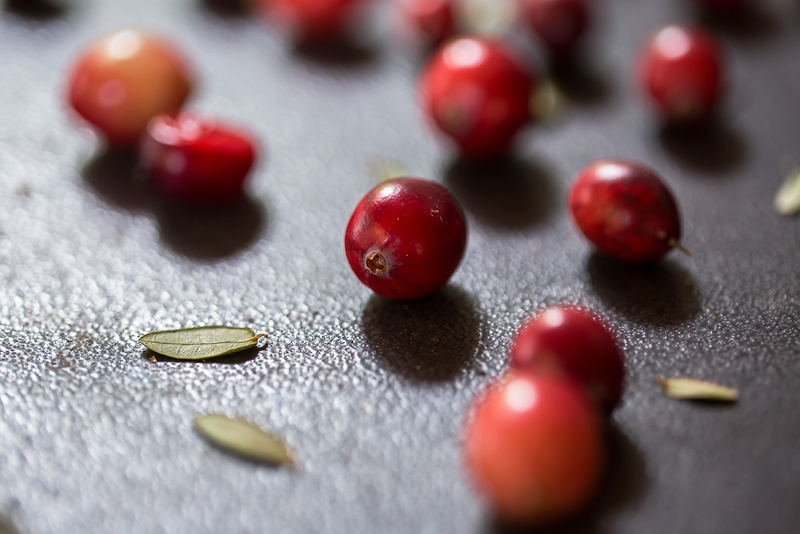 When sugar and honey became available in the 17th century, people incorporated the sour berries into tarts, jellies, and preserves and of course the ever-popular cranberry sauce. The berries cook relatively fast and while they heat up they make a soft popping noise in the pan. Nowadays, recipes abound, cakes, breads, tarts, galettes, sauces, jellies, chutneys and chocolates, you name it. At Stone Bridge farm we were greeted by the owners, Joanne and Scott Harding who took us on our first cranberry bog tour. 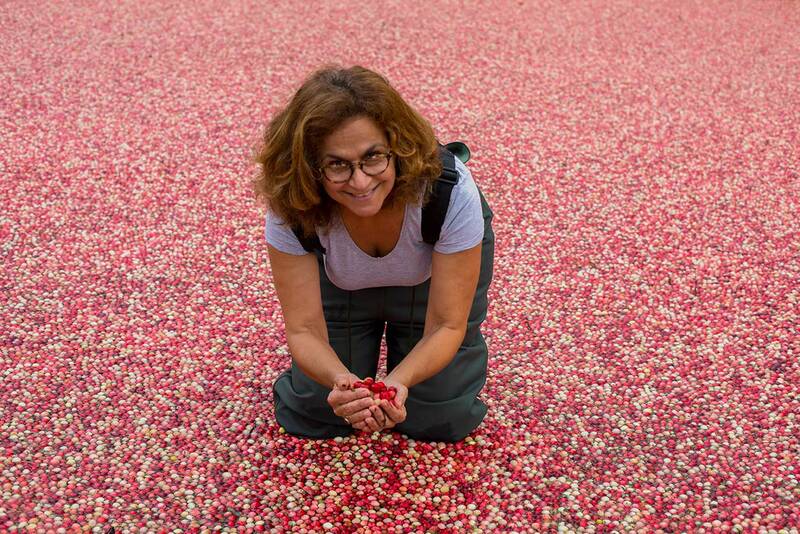 They had lots to tell about cranberries and I was surprised when Scott asked me about olives and later explained that Joanne’s Greek family grew them. The couple have been running the farm for the last 25 years and they admit that despite the hard work they take pleasure in continuing a tradition. They handed us waders and both my husband and I went into the bog. First we mucked about, then a feeling of total peace took us, something to do with still water and floating berries. Joanne agreed, and mentioned that it would be a great place to have a spa where people could come and relax. I don’t think she actually meant inside the bog. We walked around the fields; there were no neatly planted rows of vine, with red fruits hanging beautifully off the branches. The low growing shrubs looked dense and disheveled; the berries hidden amongst the greenery were not like I had imagined. Scott showed us an antique hand-picker, a comb-like instrument made of wood and cranberries in burlap sacks and crates. The rural setting and the rustic implements took us back in time. 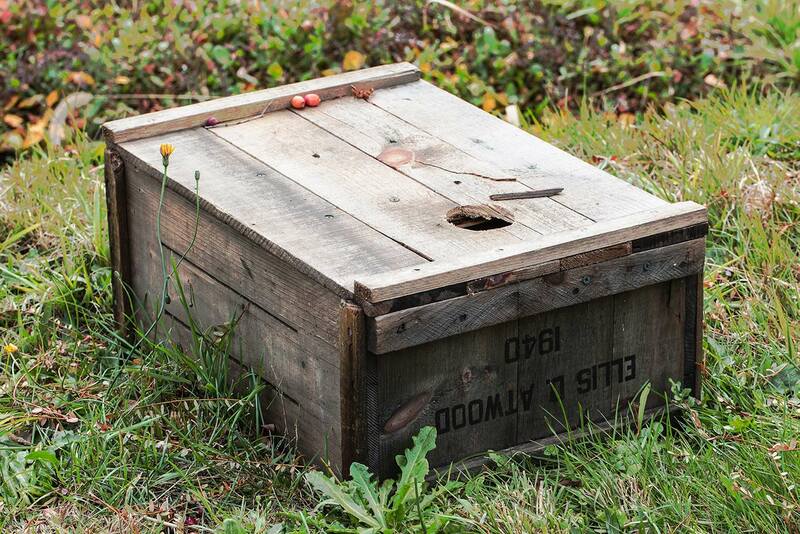 My husband from being reluctant at the outset, became enchanted both by the visit and the taste of cranberries; he insisted on buying a sizeable amount, enough to fit a weathered wooden crate with a date and the producer’s name stencilled on its side. 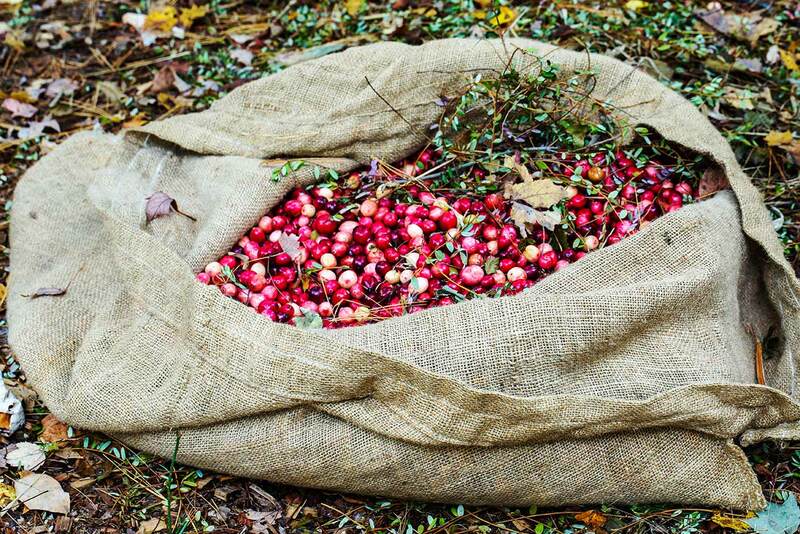 We returned home with 10 kilos (20 pounds) of freshly picked cranberries which had not yet been sorted. It was up to me to go through the pile. I am used to sorting olives for curing; we chose the biggest and keep those that are blemish-free. Apart from their colour, sorting cranberries felt the same; I discarded all the spotty ones and all that were soft and mushy. After a while I was able to spot the latter immediately because of their almost translucent skin moreover they do not bounce. If you drop a perfect cranberry , it will hop endlessly on the hard floor and you’ll have a hard time catching it. Now I had to begin experimenting with ideas and recipes. First I popped a few berries in the juicer together with other sweeter fruit hence adding vitamin C and many antioxidants to my morning drink. We’ve since been gulping the cranberry juice mixes with the comforting feeling that we are looking after bodies. Then I preserved a few in syrup and alcohol (this is perhaps a little less wholesome). As the flavours seep through, in a couple of months I’ll be able to sip it as liqueur or ladle a few fruits over ice cream and spongy cakes. The idea of a crumble came in nice and easy, I didn’t have to make or roll out pastry; there was nothing to pre-cook, I just composed, baked, and enjoyed with ice-cream. Things became a little more complicated when I decided to make chutney with Indian flavours. I had no point of reference, so it took me a while and a lot of adding and subtracting ingredients to get the desired taste. I now have a row of jars labeled, ‘Very hot’, ‘Hot’ and ‘Not so Hot’; I will enjoy them with cheeses, and meats and they’ll also come in handy as home-made Christmas gifts. The cooking-cranberries-saga will continue as I have only gone through half of my harvest; I will make, tarts, breads and of course a cranberry sauce for my second US thanksgiving. I am a fan of both olives and cranberries. Thank you for a very interesting and detailed article. Great Lizbeth, Thank you for reading it. A joy to read, all the posts in fact, not only this one, and gorgeous photos. Many thanks for taking the time to provide all the cultural/culinary details. The crumble, which we were fortunate to try was really delicious. Will it be possible to also provide the American measuring equivalents of cups and spoons? I will work out the American cups measurements. Thanks for pointing it out. You are so right.